Babies seem like they don’t have an “off” button once they learn how to walk (and eventually run). My son would get into everything and anything he could—especially doors. Don’t ask me why he had a fixation with them, he just did. He loved turning the knobs, watching them swing open, slam shut, and of course he loved wedging his fingers in between the cracks! Hello, how not safe? But, he didn’t care. And, it took a few times of close misses and minor pinches to really give us a wake up call—we had to do something and fast. So, we pretty much purchased all the baby-proofing door devices you can imagine. Some were much better than others. We may have wasted some time and money, but you don’t have to. Here are 10 tips (and some awesome products) for baby-proofing your doors! The first tip I have for you is to pick up a box of Wittle Finger Pinch Guards (click here to check the price on Amazon). They come four to a box and have been a lifesaver in our home. They are soft foam “c” shaped objects that fit on any size door without the use of hardware. 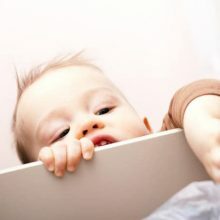 So, when you want to prevent your child from hurting themselves, place the pinch guard on the outer edge of the door, out of reach from curious fingers—the door won’t shut. You can also put a pinch guard on the top of your door (at least 6 inches from the outer edge). They’re a cinch to remove when you do want doors closed and they are discreet and non-gaudy (unlike some other door devices I’ve seen). Another great tip is to invest in a Door Monkey Door Lock (click here to check the price on Amazon). This door lock works wonders and is easy for adults to use, but complicated for curious hands to operate or remove. It can be mounted at either side of your door, at any height. No hardware is needed, or tools. And, I like it because it can be used with any style of door knob or lever handle. It doesn’t allow the door to fully close, hence you don’t have to worry about fingers or hands getting stuck, or getting locked out of a room (because I know first hand that is beyond frightening). Another tip I have for you is to check out another great door proofing device called the Door Buddy Lock (click here to check the price on Amazon). It’s a big strap that keeps kids out of a room, but it allows cats and small dogs in! It’s simple to use and I could install it quickly, without my husband’s help. It can be used on any door since it’s adjustable and fully customizable to the type of opening you need to make. It has a strong hold on one side (super strong and sticky adhesive), and adults can latch or unlatch it on the other side to access a room but keep kids out. I used this primarily on my bathroom doors to avoid any playing in the potty, and also in my laundry room since that is where I kept my detergent tabs (which look like candy) and my other cleaning supplies. Overall, the door locks did their job and were accommodating to my pets. We didn’t use our cellar often, so I placed one of our baby gates in front of it (we like this one by Summer Infant). Gates are a cheap and easy option to ensure your kiddos don’t get near a door that could pinch them or suffer a fall that could harm them! Check out our detailed guide on how to choose the best baby gate! If you are on a mega-budget, one thing you could do is place an old hand towel that you aren’t using anymore over the top of your door (this works on any door). It instantly causes bulk and friction when your child tries to shut the door, which keeps their fingers and hands safe and not locked in. Some maneuvering may need to be done with the towel if it’s too long or bulky (cut it into a smaller section). And, you can even do this with old clothing. It doesn’t look the prettiest, but it’s good to do if you’re waiting for your door devices to arrive or are visiting family members at their non-baby proofed home. Your kids can’t pinch their fingers if they can’t get a door open to begin with. Door covers are great for babies just learning how to walk, and other younger toddlers (we recommend these ones from Munchkin). They are rounded, plastic pieces that need a lot of force and effort to squeeze them and turn the door knob. I noticed my son knew how to figure them out around his pre-school years, so you won’t have them as a long-term item. But, they are ultra-affordable and they do a great job in the meantime. Plus, they are easy to toss into a diaper bag so you can always have a set or two on hand when visiting others or vacationing outside your home. Hexagon gates are also great safety items because they can be bent and positioned into many figures (not just a hexagon). This one from North States is super popular (click here to check the price on Amazon). I often totally blocked my baby from a row of doors in our hallway once he started walking, by positioning the large, straight gate across them. The gate is fully portable, so you can bring it with you when you visit friends and relatives’ houses who many not have baby proofed doors for an added safety measure. Block a door or section off an entire room—this way, doors are just not an option (or a worry)! Use some pool noodles (we like these from Swimline) to make door stoppers. Simply cut a noodle in half (or fourths) and stick them high up on the edge of doors so they will stay put and stop any door from closing! My in-laws loved doing this on their pantry doors since my son was constantly trying to get into them! I can’t tell you how many toilet paper rolls I’ve tossed instead of saved. But, if you have some empty rolls on hand, slip them on top of door knobs. Your child will grab the rolls instead of the knob, and the rolls will, well … roll! This will not allow your child to get into any room. If your rolls are too small for your knobs, simply cut a strip of cardboard that will fit over top of it, roll it up, and use duct tape to keep it in place. Cheap and functional (and also make shift at any venue)? Definitely! If your knobs have locks, it may be wise to either remove the lock portion if possible, or simply swap knobs for something that cannot be locked at all. This can get a little tricky for your bathroom, especially when you have guests over, but babies and toddlers are fascinated by knobs and buttons. Many of my friends did this and they were glad they did because they never had to worry about their preschoolers locking them out in a fit of rage. I literally watched my 14 month old push the button in on our bathroom door knob and pull the door shut—literally locking everyone out of the bathroom. He thought the button was “meant” to be pushed. So, once we took that temptation away, we never had any additional mishaps. We didn’t feel like changing all the knobs on our own, so a hired handyman did the trick (and was very reasonable!) It’s an option—just sayin’. I had a few friends who only had latch style doors, and they refused to buy baby proofing devices. But, I tried to tell them those shiny handles would be too tempting for their little ones not to fool with. Boy, was I right. After that, they decided to install a few latches high up on the door so only they could access. (These latches from WonderKid are a great option). This way, they could let their kiddos roam the halls without worrying about them playing with doors or getting pinched since they were totally unable to get the door open! Babies, toddlers, and kids have to be watched! While you do you very best, they are curious little beings who don’t have their personal safety in mind. Help them stay safe by baby proofing your home and especially your doors. You’ll be spared from crying, whining, minor, and even serious injuries. Consider some of these tips and awesome items mentioned above to ensure you are fully equipped with the best precautionary items around when it comes to keeping kids safe and happy.